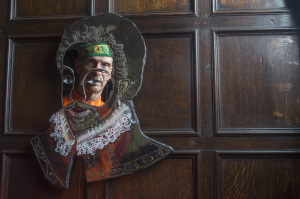 An exhibition of contemporary art by the renowned sculptor Andrew Logan will open on Saturday 1 July at the National Trust’s Buckland Abbey in Devon. ‘The Art of Reflection’ interprets the history and spirit of the abbey in 18 Logan sculptures, placed in 13 selected locations throughout the house and gardens, including the Great Barn, Kitchen Garden and the historic Cart Pond. The exhibition, one of the largest ever staged by the National Trust in collaboration with one artist, is curated jointly by Buckland Abbey and Andrew Logan, with work selected from five decades of the artist’s career. A major attraction will be Andrew Logan’s new jewel and painted glass portrait of Sir Francis Drake, Buckland’s most celebrated owner. ‘The Art of Reflection’ has been organised under the conservation charity’s Trust New Art contemporary art program. Reflecting themes ranging from exploration and discovery, to peace and tranquility, and nature and the universe, ‘The Art of Reflection’ includes ‘Goldfield’, one of Logan’s earliest public commissions from 1976. The giant installation will fill Buckland’s Great Barn with 4.5-metre high wheat stalks, field mice and floating butterflies. Other exhibition highlights include ‘World of Smiles’, a hanging globe in Drake’s Chamber, echoing his circumnavigation of the world, and ‘Life and Oomph’, Logan’s life-size sculpture featuring Royal Ballet principal ballerina Lynn Seymour, reaching out from a sea of pearls. Never previously exhibited, ‘Life and Oomph’ will be installed in the former Long Gallery, a space historically used at Buckland for recreation and dancing. 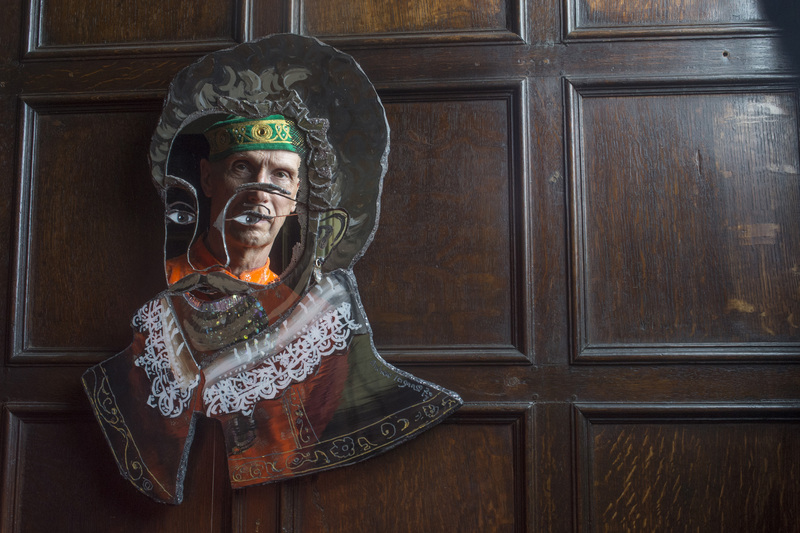 The abbey’s dining room is to be transformed by Logan into an installation titled ‘Dinner with Andrew Logan and Friends’ featuring artworks by his friends Duggie Fields, Jennifer and Christine Binnie, Richard Logan and Dame Zandra Rhodes. Buckland’s gardens will be home to Logan’s ‘Four Flowers of the Apocalypse’, a floral tribute to the abbey’s spectacular natural setting, and ‘Excalibur’, a 3-metre glass sword rising out of the abbey’s Cart Pond. ‘The Alternative Miss World’ event which Logan conceived and has run for over 40 years will be represented by the ornamental ‘Elements’ and ‘Universe’ thrones on which the competition’s winners have been crowned. During the exhibition, Buckland’s visitors will be able to try out the thrones for themselves in the Great Hall which has welcomed many famous noblemen and dignitaries during its colourful history. Buckland’s volunteers will be given specially created pieces of ‘apple’ jewellery to wear in celebration of the abbey’s 700 year old history of apple-growing and cider-making. Other pieces from Logan’s Heritage Jewellery collection will be displayed alongside historic artefacts in the abbey’s collection. James Breslin, Buckland Abbey’s House & Visitor Experience Manager said: “We’re thrilled to be working with an artist of Andrew’s calibre and to bring his work to Buckland. We have designed the exhibition with Andrew to weave its way through our existing collection and historic spaces, offering new and exciting ways to reflect on Buckland’s past through contemporary art. ‘The Art of Reflection’ runs until February 2018.